While studying the history of design, I have found a document (FR) that states that during the interwar period, people were both attracted by technology and nostalgic of the past, but I can't find any concrete example of the nostalgia of the past in the context of the design. I believe that is referring, at least in part, to Art Deco. Art Deco artists were simultaneously taking from the past and looking to the future. This was a unique combination and created a distinctive style that gripped the imagination of the public. 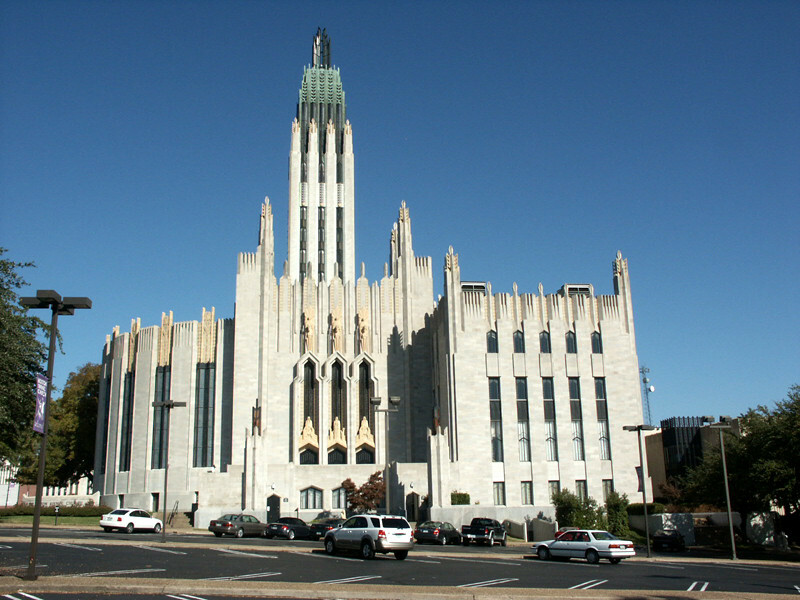 Boston Avenue UMC (my own church), which was designed and built in the period in question (the 1920's), is a prominent example of Vertical Art Deco. The effect is reminiscent of Gothic, but using concrete and steel in addition to stone with a modern (for the '20's) look. And of course no buttresses required. I have specifically been investigating the common daily life in the interwar. Based on American magazines and catalogs, Art Deco was almost invisible. Now and then The Home Workshop will have a "modern" table or smoking stand, but for the most part everyone wanted actual antiques or reproductions of Sheraton, Hepplewhite, Chippendale, Queen Anne - even Jacobean chests with barley twist legs. All the house catalogs are full of mock Tudors and Colonials, with relatively few moderne houses, mainly in concrete. Catalogs by furniture manufacturers are full of turnings and cabriole legs, not shaped plywood. Unfortunately, the latest general catalog I have is 1922 Montgomery Ward. Now, in 1946, Popular Science Monthly has "how to furnish your house" which is all modern, but that's because they want simple, quick, plywood furniture. For years they were doing plans for grandfather clocks, piecrust tables, and spindle-turned tea-carts. So while the architectural greats undoubtedly were forging forward - one sees more stream line in public buildings - in homes most people wanted "traditional" decor, which is nostalgic. The blend of tradition and technology might be the Sheraton style radio or phonograph cabinet.